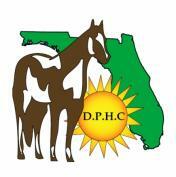 DPHC will Host Show to Benefit Horses for Heroes! Hello All, Tony here wishing you a safe and enjoyable weekend! On Saturday and Sunday, the Dixie Paint Horse Club (DHPC) will host a horse show and Chinese Auction at the Tampa Fairgrounds. The show is free to spectators and the auction will benefit Horse for Heroes and wounded servicemen and women in their rehabilitation from war-related injuries. Vendors and DHPC members have donated more than 40 gift baskets, awarded to the winners of a Chinese Auction. Tickets will be sold for $1 apiece and dropped into a bag for a specific basket—the more tickets you buy, the greater the chance of winning! Names will be drawn at 5 PM on Saturday afternoon. Horses for Heroes is a program that uses recreational and therapeutic horseback riding to assist military veterans and their families. The program is provided absolutely free to all veterans of active duty military service and their families by the Sarasota Manatee Association for Riding Therapy (www.smartriders.org). For more information on therapeutic horseback riding for wounded veterans, please visit www.projecthealinghorse.com. For more information on DHPC, visit www.dixiephc.com. That’s all for today, but stay tuned for more Tampa Bay area events around the area!